In the middle of the desert of Nevada lies a place full of unforgettable moments and memories. When arriving at the city in the evening you can see the shining lights of the legendary city. Once Casino follows the other and the strip, the famous boulevard is filled with life. There are two opinions about Vegas: either you love it or you hate it. Those who love it, love the restaurants, the clubs, shows, music, party, gambling, everything. Those who don’t like it just find it too much. Vegas fascinated me and I think that it’s just impossible to escape the great mood when you are in Las Vegas. The hotels in Las Vegas are an amazing and are an imitation of sights and cities from all over the world: Venice, New York, Paris, Luxor and much more. Those who love to party and love to have a great time will be a happy returning guest in Vegas. Hostels can be booked from $15 per night, but you will share it witht other people. If you want a singel room you will have to pay $60. Paying less for a room could be a disdavantage, because mostly the hostels are located outside of the city and you have to take a taxi to get to the center. Less expensive hotels are available from $40. In Las Vegas you can find many low budget hotels with good quality, most of them are located close to the strip. The price covers only your accomodation, some hotels offer also breakfast or dinner. If you want to make your stay more fancy, you can book a room at the legendary Bellaggio Hotel or the Venetian. The prices start from $100 and about the price only the sky is the limit. Every hotel has some special offers that you can figure out already before starting your trip. During my stay I booked at the Excalibur at the beginning of the strip and paid $67 for a two bed room. Many hotels offer all you can eat buffets for $10-$20.If you want to eat in a restaurant out of the casinos, you will pay around 30$ per person. The restaurants inside of the casinos are usually more expensive and you should plan to spend $50. Many casinos also have fast food restaurants, but they are more expensive than those on the strip. If you want to save good money, eat away from the strip. There is the Las Vegas Strip Trolley which brings you through the city for already $2,50. A daily ticket for the monorail costs $12, but some routes are also for free. The ticket for the 24 hours deuce bus is $8. You can also take a taxi in Vegas, but you will at least $10 when you are moving on the strip. Eating at all you can eat buffet will give you the advantage to save a lot of money. The food is good and you can eat more than you need for only $20 a day. Be careful when using a credit card, especially when taking taxis. You will pay a transaction fee of $3 per payment. It’s better for you to pay cash. Las Vegas overcrowded during weekends, because a lot of people come from California to party in Vegas. Don’t be surprised if the hotels are expensive during the weekend. Travel during the week, you won’t regret it. Of course you can’t go to Vegas without gambling. But you should always play carefully. Only play if you don’t risk too much and if you can afford it. Some hotels offer vouchers with discounts for different restaurants or shows. Ask for some discounts at the reception. Casinos sometimes offer compensations for those who lose. Ask for some compensation and maybe you can get a food voucher or some percent for your next stay. Who knew that Las Vegas is a real paradies for foodlovers. It’s not neccessary to stay in line to get some gret foos, because you can find great food everywhere in the city. Even if you want to save money during your trip you shouldn’t skip a nice evening at a restaurant. Try the Aurole at the Mandala Bay hotel, the Yellowfish in the famous Bellaggio and the Otto in the Palazzo hotel. One of the many reasons, why people love to go to Las Vegas is the great choice of shows every evening. Britney Spears, David Copperfield, the Blueman Show and many more offer fantastic shows. When booking your hotel, sometimes you can get a discount on a show, so don’t forget to ask for it. When you are still without ticket you can try your luck a few hour before the show start. Some people sell tickets for a good price. Casinos, bars, clubs, there are plenty of options to party all night long in Vegas. But be careful: everybody want to party in a club, so be prepared that you will have to wait in front of the clubs. Sometimes you will wait an hours or more and in the end you are not allowed to enter, or you have to pay an overpriced ticket. Good luck with that and have fun at Marquee, Tao or Haze. You can’t go to Las Vegas without gambling, this is just something you have to do there. No matter where you are, the temptation to play is everywhere. Try your luck and maybe you will win the money for your next travel. But don’t forget to play with care, otherwise you will turn your trip into a nightmare. You haven’t been to Venice? No problem when you are in Vegas, because you can find the copy here. Kitsch and cliché is evereywhere, but on the other side it’s beautiful to see the gondola on the artificial channel inside the hotel. The architecture and the interior is stunning. No question, this hotel is one of the most beautiful on the entire strip. There is no movie about Las Vegas without the legendary fountain in front of the Bellaggio hotel. People gather in front of the fountain to see the amazing light show and music and spend romantic minutes there. Want to see the city from above? Stratosphere is one of the highest towers in the USA which offers a stunning view at the city. If you feel brave enough, you should go there and enjoy it. There is a restaurant at the top of the tower, where you can dine and enjoy a 360 degree view. If you like the thrill, check out the rollercoaster on 280 m.
Las Vegas was one of the most popular mobster city in the USA. Check out the Mobster Museum to learn more about the organized crime in the city. When you are already in Nevada, you shouldn’t miss the chance to visit the Grand Canyon. Even if it’s not very close to Las Vegas (400km), it’s really worth it and you will be amazed by the great view and you will have an unforgettable time. 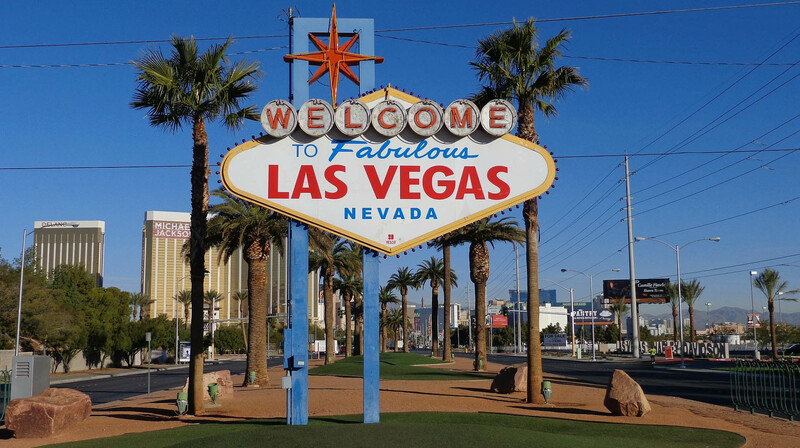 Many travel agencies offer trips from Las Vegas to the Grand Canyon and the Hoover dam. The Shark Reef aquarium at the Mandala Bay resort is one of the greatest in the world and is a must for people traveling to Las Vegas. You will see sharks and many other dangerous sea animals. Entrance is $18. When you want to escape from the city and spend time in the nature I recommend you the Hoover Dam which is located only a few kilometer away from the city. It is the biggest water reservoir in the US with 35 billions of cubic meter. Every year, millions of people visit the dam.